Organist William McGeown pictured with St Matthew’s Church Choir, Broomhedge at a family on Sunday morning 26th April 2009. 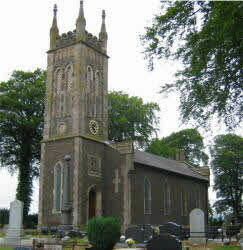 St Matthew’s foundation stone was laid in 1839 and the church was consecrated as a Chapel of Ease to Lisburn Cathedral in September 1848. It was served by curates from the cathedral until 1865 when a perpetual curacy was established. The first rector, the Rev John Leslie, was appointed in 1880 and served Broomhedge until his death in 1927. In 1899 many improvements were carried out. A transept and vestry were built on the north side, the chancel end was raised, and the choir stalls placed sideways. This part of the church is divided from the rest by a plinth of Scrabo stone. The Sanctuary was provided with new rails and wrought iron standards, and the floor tiled. A new heating system was also installed. Improvements continued throughout the 20th century including the introduction of stained glass windows and other fixtures and fittings. The present rector, the Rev Peter Galbraith, was instituted in May 1991. The most recent building project was the opening of a new Church Hall in February 2001, replacing the Bradbury Memorial Hall erected in 1952.